Our group travel department is on hand to offer advice and expertise in arranging all elements of your trip. With experienced tour planners and smart professional coach tour drivers, Panolympia can draw on a wealth of knowledge of the coach holiday business. 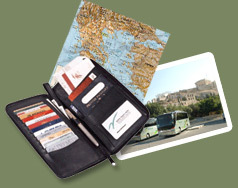 Therefore, if you are looking for a tailor made tour for your own group, you can call on our services with confidence. A dedicated Group Travel Department can quickly put together any holiday geared to your own specific requirements, with full back up services for the group organiser including personal consultations, help and advice on routes and itineraries, personalised printing etc.